This page is about the American medium tank M4. For other uses, see M4 (Family). The Medium Tank M4 Sherman is a Rank II American medium tank with a battle rating of 3.7 (AB/RB/SB). It was introduced along with the rest of the American ground tree in Update 1.45 "Steel Generals". Armed with a 75 mm cannon and a sloped front armour, the M4 Sherman gives the balance of fire power and mobility for the US ground tree. 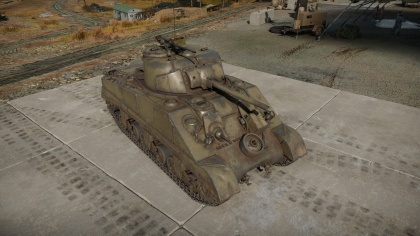 The in-game model represents a "Sherman 1.5" design with a M55 telescopic sight in a new gun mantlet with appliqué armour added in front of the gunner and on the ammo racks. The iconic American medium tank has a very distinctive silhouette with its high front sloping armour, flat sides, and rounded turret shape. The olive-drab green M4 medium uses a welded construction for the hull, resulting in the sharp edged hull shape compared to the cast M4A1 medium. The turret, constructed the same way with cast in all 75 mm M4 medium variants, used a M34A1 gun mount for the 75 mm M3 gun; a change from the M34 gun mount in that the M34A1 used a combination of a M55 telescopic sight and a M4 periscope with a M38 telescopic sight in it. The hull's sloping glacis is at 56 degrees, as usual with the early model of M4 Shermans. The model is a "small hatch" variant as seen with the parallel hatch shape with the hull. This configuration also caused the hull to protrude with the hatch for the driver and assistant driver, resulting in the interruptions in the slope that compromises the sloped armour overall effectiveness. To mitigate this problem, armour plates are welded in front of the interruptions for additional protection. Aside from this note, some other features on the front glacis are the bundled desert-coloured jerry cans in the driver's area and the road wheel right on the transmission cover. On the side hull, one distinctive feature of the M4 Sherman was the added appliqué over the sponson ammunition area. While this does provide minute protection, they also serve as highlights for the enemy to aim for an ammo rack destruction. The 75 mm cast turret, designated D50878, was one produced in early 1943. The early M34A1 gun mount design added onto the tank as well as an appliqué "cheek" in front of the gunner, as the redesign of the turret and room for the power traverse caused the armour in front of the gunner to be thinner than the rest of the turret. The M34A1 gun mount is noted as early due to the presence of lifting rings on the top of the gun mount as well as mounting bolts on the sides, both that are eliminated in the later model. A curious note for keen eyes is the lack of a loader hatch on the turret top, a feature not introduced until productions in late 1943. Another note is the pistol port on the left rear side of the turret. On top of the commander's cupola is the distinctive .50 cal M2 Browning machine gun that is commonly seen on American vehicles. The M4 medium's use of the Continental R975 radial engine results in a distinctive engine deck as well. It has a protruding hood over the air intake on top, followed by a relatively flat top all the way to the rear. Besides the hooded air intake on both sides within the shielded wall are filler ports for the radiators. Outside of the wall are two more filler ports for the fuel tanks on both sides. On the very rear, the large engine doors are visible, featuring early door hinges used as early as the M3 medium. On both sides of the door, engine filters are also present. Front armour has two protruding areas for driver and co-driver hatches. These are weak points as they present a flat armour surface. Though most high-end anti-tank weapons can cleave through the M4 Sherman's front armour rather easily, some smaller-calibre weapons less than 75 mm would have some trouble going against the front armour. In these cases, aim for weak points like the protruding hatches in the front sloping armour, or even the crest of the transmission housing, where the slope is minimum in both areas. The turret has a very robust construction so if there is no faith in penetrating through the front hull easily, don't bother trying to penetrate the turret from the front except for the very small weak point on the gunner's position of the turret. If a shot can be made to the M4 Sherman's sides, send it towards the front half of the tank where it would either cripple the crew or ignite one of the ammunition racks strewn all over the internals. The M4 Sherman is powered with an engine able to adequate for it weight class, coming with a hp/ton ratio of 11 ish. While accelerating up to this speed can be sluggish at first, the M4 Sherman takes to a running start after Gear 4. The M4 Sherman is armed with two machine guns, a 12.7 mm heavy machine gun on the pintle-mount atop the M4 Sherman turret, the famous .50 cal "Ma Deuce" machine gun. This weapon is the same type as the one used in American aircraft, though at a lower fire rate. However, this leads to the anti-aircraft power of the weapon as most formidable against low strafing attacking aircraft. The second machine gun is a general-purpose 7.62 mm M1919A4 Browning machine gun mounted in the coaxial position. A typical machine gun not too unlike on many other vehicles, the machine gun is just average. The M4 Sherman is an effective medium-range combat tank. Equipped with a fast-firing 75mm gun and with good handling characteristics, the M4 can be an extremely useful asset in most battles. In battle the M4 performs well as an all-rounder; the thick turret front and 10 degrees of gun depression make the tank ideal for taking hull-down positions which protect the thinner hull armour from being penetrated by enemy fire. The sloped front upper glacis, when angled, also provides good protection against enemy fire. An unusual - and useful - difference is that the upper glacis is sloped at 56 degrees rather than the standard 45 degrees, making it more of a threat and more powerful due to improving the chances of a round ricochet. The only downfall may be the 2 crew member position in the front that protrudes out to form a flat surface, but both are covered with an additional 20 mm plate. The reasonable mobility of the Sherman makes flanking a viable tactic. The main weakness of the M4 is the side armour - not only is it vertical and thin, but behind it most of the ammunition is stowed. The tall silhouette of the tank also makes finding suitable cover difficult. Overall, the M4 Sherman can be considered as an armoured jack-of-all trades - it will serve a tanker well, however it will not excel in any particular role. In battle, try to use terrain as cover. Hull-down positions are especially strong in the M4 Sherman, as it has a good 10 degrees of gun depression. The gun mantlet and turret is reasonably strong, but avoiding shots is still the best strategy. In this respect, a hull-down position hides the vulnerable hull. If this is not available, then angling the hull armour to present a greater slope is often a good idea, as this can bounce some low-powered cannon at any range and at longer ranges, render the hull impenetrable. Another way to play the M4 Sherman is to tap into its traditional cavalry role, its mobility. The M4 Sherman is a great flanker as it is fast enough to get the jump on the enemy's side. Defeat the enemy at their weak front lines or go around the entire enemy force. Once in position at their sides or rear, ambush them. Ideally, the enemy should be too busy focusing on allies attacking in the front to notice the M4 instantly. Take out the weaker light or medium tanks, the 75 mm gun is not very ideal against heavy tanks like the KV-1 so take out its friends to allow allies more room to outmaneuver the KV tank. An organized attack will increase the M4 chances on the battlefield and success. The presence of a pivot-mounted .50 caliber machine gun gives the Sherman some flexibility. It can engage softer targets such as some tank destroyers and many SPAAGs at short ranges, when loading a HE shell would be inconvenient. While not ideal, they provide the Sherman tank some measure of protection against aircraft- sometimes enough to dissuade a pilot from making another pass. It can be an effective rang-finder for targets at longer ranges where the M1919 in the turret would be less effective. While it pales in comparison to the destructive effect of tank guns, it provides the Sherman some flexibility over other comparable vehicles, who are restricted to their rifle-caliber coaxial machine guns. A vehicle that the M4 Sherman will have trouble against is the KV-1. While the L-11 is underpowered, the ZiS-5 is potent enough to punch through the Sherman's front, and the Sherman is unable to penetrate the KV-1's thick frontal armour. If this heavy tanks is encountered, try to shoot it in its sides and rear, where its armour is thinner and unsloped, though it will still have to be at a close range to penetrate the armour. In addition, shots to the sides will most likely hit fuel tanks or ammunition storage, causing a fire or ammunition detonation and at best, time to reassess the situation. The historical nemesis of any Sherman, the Panzer IV is one of the Shermans biggest threats at this rank. The long barrel 75mm gun will easily penetrate the Sherman from the front. The F2 variant is admittedly easy to deal with. A single APCBC to its hull or turret should end it pretty quickly, even at long range. The other variants are slightly harder to deal with. They have thicker hull armour, at 80mm, which will be much harder to penetrate with the APCBC over 500m. Luckily the turret armour remains the same at 50mm. Either aim here with APCBC or sacrifice damage potential and use the AP round to penetrate the hull. Another historical nemesis of the Sherman, and another big threat. The StuG III packs the same punch as the Panzer IV line with its long barrel 75mm gun, whilst losing the turret, which turns out to be both an advantage and a disadvantage. Lacking a turret means that it will have to traverse the whole vehicle to target an enemy, but it also means that it has a lower profile. The StuG's armour profile is also more complex than the Panzer IV, with less flat areas. Certain areas are sloped and very bouncy. Luckily, there is a big weak spot. There are two flat plates on the front of the hull. The flat plate on the right is the drivers port. Shoot that and you are able to kill the driver, gunner and loader in one go. This is a very efficient way to destroy this vehicle. With the F variant you can use APCBC to instantly one shot this vehicle. With the G variant it is more reliable to use AP at ranges over 500m to ensure penetration. 75 mm gun can prove quite effective with a generally fast firing rate with adequate beyond-armour damage with the M61 round. Very mobile once accelerated to a certain speed. Front armour is very resilient and well-sloped with minimal weak spots. Pintle mounted HMG provides anti-aircraft defense. Jack of all trades; can accomplish most roles on the battlefield. 75 mm gun may not prove the most penetrative weapon against its contemporaries. Front glacis has driver and co-driver hatch protruding from front armour, exposing some weak points. Fuel tanks and ammunition stored in upper hull; penetrating shots are prone to setting these off. Ammunition is highlighted by bulges in the side armour. High profile makes it an easier target than most. Jack of all trades, but is thus not very specialized in any specific role. The Battle of France in 1940 proved to America that their current tank arsenal would not be able to withstand a German assault. The only tanks in their inventory at that time was the M2 light tank and the M2 medium tank, both are inadequate against the German Panzer IIIs and the Panzer IVs. The US Army, in response, ordered for a tank armed with a 75 mm gun. While a 75 mm gun was available for use, a turret able to mount the gun was not. So while the turret and tank design underwent development, the 75 mm would be mounted on the stopgap M3 Lee tank in a sponson mount. This interim design put the 75 mm on a lower and limited traverse mount that restricted its firing angle, but it did give the Western Allies a tank with the gun, so it was issued by the thousands until a better design could be produced. During the M3 medium's development, the designs of the 75 mm armed vehicle were being drawn up and submitted by the Ordnance Department. Specifications on the tank design were strict in order to maximize logistical support. Restrictions were made on the tank's height, width, and weight in order to make it able to be transported over bridges, roads, railroads, and on naval ships. These specifications would help the Army by making the tank be very flexible on strategic, logistical, and tactical grounds. On April 1941, the Armored Force Board chose the simplest of the designs, which was a redesigned M3 hull and chassis with a turret mounting the 75 mm gun designated the T6, completed in September 1941. This tank would then designated the Medium Tank M4 in American service. The tank would eventually become the most used Allied tank during World War II as it was lended out by the thousands in the Lend-Lease program to the Allied countries. The British designated the M4 the "Sherman", which coined into the tank's name M4 Sherman that it would be known as in history. The production for the Shermans began on October 1941 and would continue to be produced until the end of the war in 1945 with around 50,000 units produced, making it the second most-produced tank in World War II before the T-34 tank. Many variants of the Shermans were produced, but they all followed a similar layout. The driver and bow gunner sat in the front driving compartment, the fighting compartment in the middle housed the turret its three crew member, and in the back was the engine compartment. The Sherman used many features present in previous American tank designs, the vertical volute suspension system (VVSS) and radial engine from the M2 Light Tanks, and the sloping armour of the M2 Medium Tanks. This became a contributing factor on the Sherman's reliability on the field, as most of the design flaws were ironed out with the previous tank designs. The tank mounted the 75 mm M3 gun, giving the tank very good AP and HE capabilities. The Sherman's turret traverse speed was very fast, able to traverse a full 360 degrees in only 15 seconds, which is considerably faster than the traverse speed on most German tanks. Another unique feature on the Sherman was the installation of a gyroscopic stabilizer on the gun and sight, making the Sherman one of the first produced tanks to incorporate those features. While the stabilization was only done for the vertical plane, it kept the gun stable enough to be able to shoot on the move effectively, with a study showing a 70 % hit probability on an enemy 300 to 1,200 yards away when moving at a speed of 15 mph. However, this feature was controversial among the crew and experiences with it vary. The M4 Sherman model ran on a gasoline Continental R975 radial engine and was one of the first models of the Sherman developed. The early M4 Sherman featured the M38 telescopic sight in the M4 periscope with no zoom, but experience in North Africa and recommendations from the British changed the sight into the M55 telescopic sight integrated in the gun mantlet. This change in sights required appliqué armour to be added at the turret area in front of the gunner since the modification left the area weaker than the overall turret. This problem would be fixed in later-production models of the M4 Sherman. The tank's hull was welded, with the front armour plate placed on a 56 degree sloping angle. An early design defect with the design was the protruding armoured hatches for the driver and assistant driver. These protrusions creates "shot traps" as they were in a near vertical position that gave less protection on the front armour than the sloping areas. This was fixed on later models as well. Up to 6,748 M4A1s were produced from July 1942 to January 1944, out of the 49,234 total Sherman units produced in the war. The Shermans first saw combat in the North African Campaign in the Second Battle of El Alamein on October 1942 in the hands of the British. It was much quicker to reinforce the British armoured divisions with the more than 300 Shermans sent to North Africa than it was to create new American ones. It proved much better than the German Panzer IIIs and Panzer IVs, able to eliminate them at distances more than 2,000 yards away. The Americans received their first Shermans in the next month in Operation Torch. However better the Shermans were to the German tanks at the time, the Allied armoured units still suffered casualties against the German tanks and anti-tank guns, most notably in the Battle of Kasserine Pass. In Italy, the Shermans proved much more mobile than the German Panzers, able to travel cross-country on the hilly terrain with ease. However, it was at this stage that the Sherman's shortcoming began to take face in the advent of the newer German tanks, the Tiger Is and Panthers. These two tanks featured armour that proved impenetrable when fired at the front, and with guns that could take out the Shermans from farther than the Sherman's effective combat range. The Shermans have to hit the side of these tanks for a penetration, and at ranges that were considered suicidal. Although programs were initiated to up-gun the Sherman with a 76 mm gun, American leaders determine that the Panther and Tigers would not be produced in large quantities and were not as great as a threat as these two vehicles could still be destroyed by the 75 mm gun and standard anti-tank equipment. During the invasion of France, it was clear that the Sherman's current build with a 75 mm gun was no longer going to cut it against the German armoured forces. While the Sherman was adequate against what little Panzer III and IVs the Germans have left and against infantry and fortifications with the 75 mm gun, the Panthers and Tigers were in much large quantity than expected, and proved better in armour and firepower to the Shermans. Though in the bocage country of France, the Allies lost more tanks to hidden anti-tank guns and infantry weapons than to tanks. Despite these losses, the mass production of M4 Sherman back in the United States ensured that enough tanks were available for the Allied Forces as they spearhead through France, plus the lack of any other capable tanks meant they had to use the Shermans for the time being. The large quantities of Shermans produced during the war gave the Allied armoured units a major advantage of being fully equipped as the German panzer divisions were rarely in full strength, with some US infantry divisions having more tracked vehicles than some of the panzer divisions. Due to the high attrition rates, tank crews sometimes add improvised armour onto their Shermans in the form of sandbags and logs in hopes of increased survival, but these were determined to be ineffective from evaluations. A more effective method was to have metal armour welded on in improvisation, and an official project was made for such "assault tanks" that ended with the M4A3E2 "Jumbos" with 254 made for the fighting in Europe. The Allies continued to use 75 mm Shermans until the Battle of the Bulge in Winter 1944, when the commanders request only 76 mm Shermans to be brought into Europe as the battle showed the intense armour disparity with the German's large numbers of Panthers and Tiger II tanks. While new units arriving in Europe were armed exclusively with 76 mm armed-Shermans, the veteran units kept the 75 mm Shermans, to which it continued to do well against softer targets with little threat from German armour due to their declining numbers. The M4 Sherman's importance in the Pacific theater was less than that of the European theater due to the different tactical doctrine established from the amphibious nature of combat. Only about 20 tank battalions fielded by the US Army were sent to support the Pacific theater of operations, compared to the total 16 armored divisions and 70 tank battalions they have in service. The low priority in tanks were due to the following reasons. Firstly, the jungle terrain on most of the islands fought on were unsuitable for the deployment of large-scale armoured units, relegating armour support to light tanks such as the M3 Stuarts. Secondly, the Japanese forces' armoured units were rather inferior to the American tank forces by 1943. While the Japanese Type 95 Ha-Go tank was comparable to the M2A4 Light Tank, the Shermans out gun these tanks by a large margin. Such a large margin that the tank crew prefer to use high-explosive shots against the Japanese tank than regular armour-piercing as the AP rounds would penetrate straight through without causing much damage in the interior of the tank. The Japanese developed the Type 3 Chi-Nu and the Type 4 Chi-To to fight back the Shermans, but these two never saw combat as they were kept at the Japanese homeland for the defense against the Allied invasion. The Shermans, when deployed, were superior to most of the Japanese anti-tank equipment and often were essential to some of the Marines advances on some of the island assaults. 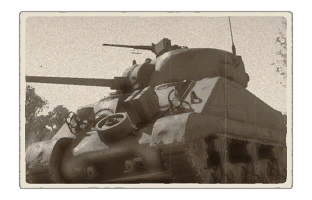 In 1945, the equipping of flamethrower Shermans known as M4A3R3, nicknamed "Zippos", were a significant boost to the infantry's firepower in having a very long range of fire compared to the standard infantry-modeled flamethrowers with the benefit of being in an armoured vehicle. The Japanese solution against the Shermans, other than with their 47 mm anti-tank guns, were often suicidal tactics ranging from placing satchel charges right onto the tank, using pole-mounted anti-tank mines to reach and destroy the tank, or even simply throwing oneself underneath a tank with a mine or other explosive and triggering it manually. After the war, the Shermans continued serving America and its allies as the M4A3E8 with a new suspension and the 76 mm gun. The M26 Pershing that was introduced late in World War II was phased out for the Shermans due to its unreliability, and the Sherman stayed until the M46 Patton was introduced. After being phased out of American service, many other countries still used the Sherman as their main tank, mainly Israel where they up-gun the tank with the much powerful post-war French 75 mm and 105 mm gun as the M-50 and M-51 respectively (nicknamed "Super Shermans"). These proved successful as they were able to fight against the Soviet-supplied T-54 tanks and T-34-85s in Middle East service, proving the Sherman as a successful and adaptable design for many years to come. Skins and camouflages for the M4 from live.warthunder.com. Due the very short vehicle version name, there is no common naming hashtag for this tank. Try the following terms: #M4Sherman and #M4_Sherman. Beware, there will be other Sherman versions with these search results.